Are you doing what you really wish you were doing today? There was an explosion at a fertiliser plant in Texas during the night. Firefighters were in the process of battling the fire of a smaller explosion, when a huge explosion took out blocks of surrounding homes. The injury and fatality numbers are still unknown, but it looks grim. I don’t believe it’s being treated as suspicious, but those details won’t surface until later. I hope for the best, and the people affected are in my prayers. We, the people of the developed world, have a tendency to take for granted the peace of our existence. That is not to belittle our struggle, but rather to recognise that we live in an environment of bounty and freedom, devoid of the persistent terror of war. The City is an imprint of a decision made hundreds, if not thousands of years ago. Someone arrived on a piece of land and figured it would meet their needs. They setup shop on that plot — perhaps there was a river nearby. They stayed there for weeks, and so others came to visit. They would stay up all night, lighting fires, chatting and hanging out. They liked the freedom of their own territory, so they decided to make it permanent. And so the story went, until they had a village and then a town. They added features to the village as needed. They build houses and between them paths which would in turn become roads for cars. The City is the largest, most persistent form of technology ever devised by humans. The City, or rather The Settlement as it were, is the original startup. 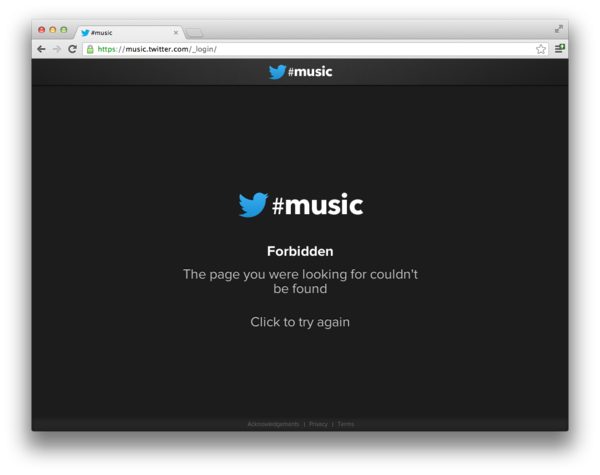 Today, I came across http://music.twitter.com. Naturally, I inspected the HTML source just to see if there were any :hidden gems. There were none, bar one curious line of code that caught my eye. The image for the ‘Sign In’ button linked to the /_login/ directory — and so my journey began. When I visited /_login/ I was presented with a page that looks something like a 404. Following my curiosity, I inspected the source of this new page. This time, the CSS document was a lot different. It contained the entirety of the App’s UI. A quick scan revealed a whole lot of words that implicate a very clear picture of what Twitter intends to do with this new Music product. First, it’s an App, which I guess was obvious; but it seems there will be a mobile app and desktop app (web), as indicated in the page footer. We’ve all had the urge to ‘undo’ a real life moment, to somehow view an ‘instant replay’ at a sports event or to ‘search’ a paper book. These are all testaments to the path we are on. We wear glasses to improve our vision. We use fire to keep us warm. Every human function that can be improved by technology will be improved by technology. The machine is already so deeply integrated into humanity, that without it we wouldn’t survive. It doesn’t exist as a selfish existential entity, but as a part of us. We are the ever improving, replicating and surviving machine. If you liked this, you may like or totally disagree with this. 35 hours eating, showering, traveling, etc. This adds up to 131 hours of our week locked-up in overheads. This still leaves you with 37 hours a week to pursue your dream or hone your craft. Time is on your side whether you like it or not, stop making excuses. In the near future, as is already the case for a lot of software we use, our devices will function as not much more than an interaction terminal. The local processor will handle caching and drawing but not the intensive process of calculating and rendering. Correlation does not imply causation, yet in this instance I believe there is value to the observation. Clear communication is the most important factor of conflict resolution, no matter how grand or small the problem. The Internet, and perhaps more accurately The Web, is the most powerful mode of communication on Earth. Without it, your worldview is shackled by ignorance, and in our age, there is no room for ignorance. For instance, in Finland broadband access is considered a basic legal right that the government must uphold and from experience, they take this very seriously — this is a good thing. I wish more countries were like this.